Robert Bateman is one of Canada’s most popular and commercially successful artists. Yet the art establishment tends to denigrate Bateman’s paintings of wildlife for being too life-like. The result: Supposedly soul-less paintings that are far from transformative. Pierre Theberge, when he was the director of the National Gallery of Canada, was once asked whether he would ever acquire a Bateman for the gallery. He replied that he had not ruled out acquiring a Bateman; he had just not seen one he liked. Francis Place. The Eagle & Cat. is part of the Beasts show at CUAG. Attempts to create life-like images of animals were once held in higher regard. Consider, for example, a small, but splendid exhibition at Carleton University Art Gallery called The Nature of Beasts in 17th Century Prints. 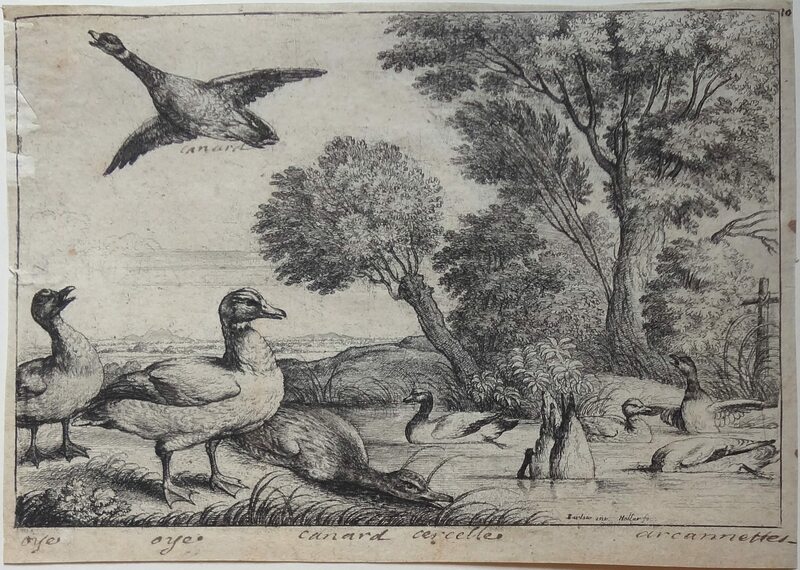 The exhibition contains mainly etchings created by the English artist Francis Barlow whose work was groundbreaking in his time for attempting to portray animals as they really looked or, at least, as Barlow perceived them. Barlow was especially famous for illustrating Aesop’s Fables and some of those illustrations are found in the exhibition curated by Nathan Flis, a post doctoral fellow in the School for Studies in Art and Culture at Carleton. The show continues until Jan. 19 but note that the gallery is closed from Dec. 24 to Jan. 2. In an interview Flis discussed his love of those prints and today’s art world snub of Bateman. 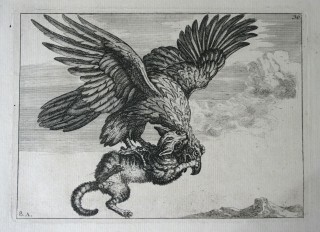 ARTFUL BLOGGER: Why 17th century prints of animals? What is it about this time period, subject matter and art form that so intrigues you? NATHAN FLIS: The 17th century is attractive to me because it was arguably the first age of global trade, and of voyages of discovery (the latter on a greater scale than in the previous century), both of which brought Europeans into contact with new landscapes, peoples, and creatures. The sight and description of creatures from the New World inspired artists to look at European/domestic ones with fresh eyes as well. The 17th century might also be characterized as a period between medieval and modern in the sense that there were still widely held beliefs that plants and animals possessed cosmological powers, that, as portents or agents, they had the power to influence our daily lives. So, looking at pictures of animals such as Barlow’s, we realize that individual creatures may not be mere descriptions of what the artist saw, or even symbolic, but that they reflect a particular way of seeing the natural world during the period. AB: Barlow’s images are, to me, life-like yet they simultaneously seem magical. How would you characterize these images? Do you see something in them beyond a mere reproduction of living creatures? NF: I would describe Barlow’s pictures as approximations of, or distillations from, nature. Naturalism, or what was then called ‘truth to life’ or the description of nature ‘from the life’, was the primary goal of the 17th-century picture-maker. And, while Barlow must have studied animal and bird behaviour from nature itself, and individual animal bodies from dead or preserved specimens, he also looked to older prints to ‘fill in the gaps’ of his knowledge, which is why some of his creatures take on poses resembling those of previous artists’ renderings. This cobbling together of different sources makes Barlow’s pictures works of artifice, as does his strategy to choose or concoct certain scenes, such as the animal confrontations in his Aesop’s Fables (1666). So, the ‘magical’ sense that comes through in Barlow’s pictures perhaps reflects this artistic trickery, but we also have the sense that Barlow saw some deeper underlying meaning in nature – that nature itself could, to use a 17th-century trope, be read like a book. AB: Are you interested in art about animals in other media and time periods? NF: As I complete a book about the life and art of Francis Barlow, I’m already beginning another more theoretical one that asks how and why animals were depicted in different ways during the colonization of North America, from the 16th to the 18th centuries. But my interest in the depiction of animals – which I see as inextricably bound to the history of the way we have seen, depicted, and treated human bodies as well — extends across time and place, from the first known human renderings of beasts in the cave paintings of Lascaux, to the photo-realistic paintings and prints of Canadian artist Robert Bateman. AB: It seems to me that, today, life-like images of animals are frowned upon in the art world. (Look at the way Robert Bateman is treated by the art world). What are your own thoughts on the way the contemporary art world treats animals in art? A: If life-likeness in pictures of nature is at all frowned upon, or has been devalued by the fine arts community, this trend has to do with the rise of photomechanical reproduction. With the advent of photography, and more recently of digital photography/reproduction and videography, there is, in general, immense pressure placed upon artists to make works of art that not only approximate life-likeness (which, to some, seems superfluous given the technologies available to us for doing so), but to go beyond this by producing something shocking. Animal art – and the way that we currently see the natural world and think about animals — has also been transformed in the wake of modern ecological disasters, a growing awareness about biological diversity, and environmental and animal rights movements. One only needs to trawl Tumblr to realize the incredible variety of representations of animals beyond what galleries are currently choosing to show and represent. It’s abundantly clear to me that animals continue to exert a powerful influence on art, and that art continues to be an essential human means of understanding animals, and ourselves.